Whew, it has been a crazy summer. It’s been so fun and exciting that I’ve let this blog go for a little over a couple months. Oops! I had a really awesome summer, with plenty of time out in the sun with friends … and got to DJ at tons of awesome music fests, like Oranje, MojoStock, and IDentity Festival. I even visited Amsterdam for my first ever international DJ gig! I had a blast and met lots of cool people. The culture over there is simply amazing! This weekend pretty much sums up the summer festival experience for Indianapolis… now in it’s fifth year, I’ve been involved since the very beginning, and couldn’t be more excited for this year’s fest. 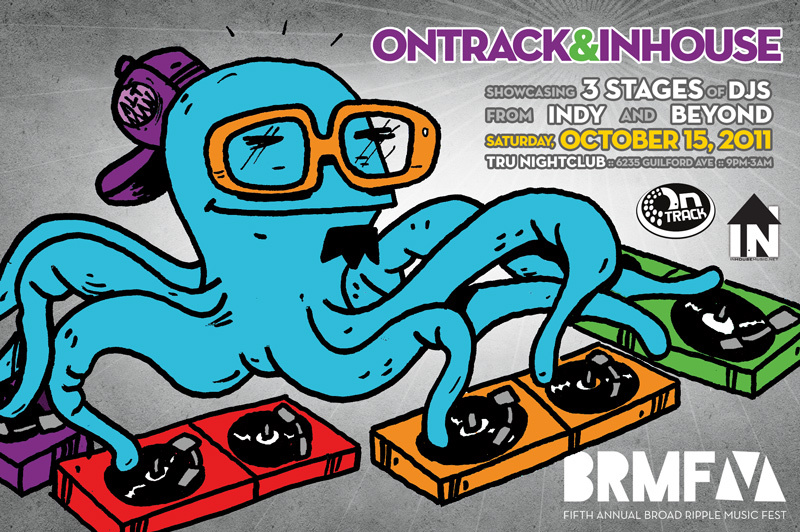 For the 5th year in a row, OnTrack (my promotion company) is honored to produce the only all-electronic showcase at the festival. This year we’ll once again be at Tru Nightclub, with 3 stages, showcasing everything from house to dubstep, electro to drum & bass, including Indy’s House Music DJ Collective, INHouse DJs. We’re giving away a couple prize packs TODAY on the INHouse DJs Facebook, so go check that out. The pack includes our new glow-in-the-dark t-shirt!